After nearly two years of work, I am very pleased to announce that the first book in the Competent Photographer series is available on Amazon. A huge thank you to everyone who helped make it possible! During our photo club’s decoration shoot this year the number one question I heard was along the lines of “how do I do that shot with the lights around it?” so I’ve thrown together a quick tutorial. This post is targeted toward beginner/intermediate, so I’m going to do my best to steer clear of the really technical stuff in favor of the plain basics. In this shot we’re going to put our subject in front of a background of colorful circles. The whole trick is to have the subject be close enough to the camera so that it’s in focus while the lights are far enough away that they will be out of focus. There are multiple approaches to the bokeh shot, but for simplicity, we’re just going to focus on this one. Set your lights in a pile and try to spread them out a bit. Place your subject between the pile of lights and the camera. You may also want to put some kind of light on your subject to brighten it up (and to make focusing easier). I’m using a flash, but a flashlight pointing at your subject would work too. Frame up your shot so that the lights fill the viewfinder with the subject between them. If you focus on the lights it’ll look something like this. If your setup looks similar to this, you’re almost ready to shoot! I said I would keep the technical stuff to a minimum, and I’m trying, but to make this work reliably you do need to put your camera into full manual mode and change the shutter speed, aperture, and ISO settings. You’ll get those settings in just a moment, but if you if you need help with how to adjust your camera’s settings you should refer to your manual. Aperture – The widest (smallest number) your lens will go to. Might be 2.8, 3.5, or somewhere close to that. It changes with your lens. If you see 11, 16, or higher then you need to head in the other direction. When you have those settings dialed in, dim the room (if you can) and take a test shot. What you’re looking for is the color and brightness in the bokeh. It’s subjective, so it’s up to you to figure out what you’re happy with. If your test shot is too bright, change the shutter speed in the faster direction to darken the image. Set it to 1/200 and try another test shot. Repeat as needed. That’s all there is to it! Once you get the basic concept down it’s easy to apply it to different situations. We used a small subject, but there’s no reason you couldn’t have your subject be a person if you just up the scale. Instead of the subject being a foot away from the camera and the lights being 3 feet away from the camera, you may have your person 5 feet from the camera and the lights 15 feet away. If you’re happy there, go shoot and have fun! If you want to get a little more in depth on why this works, keep reading. Any lights within the green area would appear as points of light. As the lights are moved into the red area, they begin to be out of focus and turn into nice circles. The farther away from the green area the lights are moved, the bigger those circles become. The distance from A to B is the camera to the subject. B to C is the subject to the lights. The smaller you make A-B relative to B-C, the more out of focus and larger those bokeh discs will be. Shooting the lights as they trail off along the floor you can see how they go from in focus, to softer and larger discs of light. Notice the shape of the bokeh changing to little footballs as it gets closer to the edges. This post won’t go in-depth on that aside from saying that she shape of the bokeh takes on the shape of the hole the light passes through on the way into the camera. You can do the bokeh shot with the lights closer to the camera and the subject farther away. The trouble there is that the wires and such may be in the way of your subject. They may not be too visible, but if you’re shooting through them they will have some impact on the quality of the subject. The bokeh will take the shape of the opening the light passes through on the way into the camera. Most of the time you want to do these shots at your widest maximum aperture because that’s where your lens opening is the closest to being a circle. As you use smaller aperture settings, the shape of the aperture in your lens takes on some corners and it’s not long before it has a definite polygon shape and so will the bokeh it makes. Notice this one has the lights in front of the subject? I had some battery powered lights dangling directly in front of the lens. Distant subject in focus means close lights will be out of focus. This week I’ve been on the hunt for Comet ISON, but that’s a post in itself. This one is about a trick I stumbled upon that helped me determine that I had, in fact, captured ISON this week and it’s interesting enough to me that I thought I would share it. It’s not always easy to find the stars in your scene when the contrast is very low – stars fading into a sky brightening from the sunrise, for instance. This morning, the conditions were the best chance I’ve had all week at capturing ISON, but because it was so close to the sun and low on the horizon, it was going to be close. Well, the time came and the sky was clear enough and I shot the part of the sky where it was, but it was so faint that I couldn’t see it on the camera’s LCD to know if I had gotten it. Above is one of the shots from this morning. It’s wider than the usual comet shots because I wanted to give some perspective of ISON against a local landmark. ISON should be in the right side of that image, just down and right of the bright spot (planet Mercury.) I can clearly see Mercury, Saturn, and the star I was using to know where the comet should be, and according to the position of those three, ISON should also be included. Unfortunately, that section of sky is starting to brighten up and wash out the stars so it’s impossible to see it clearly, but I was still curious. Did I capture ISON? A tight section of sky with the triangle of reference points and the spot where ISON should have been. Looking at just the section of sky, you can see my three reference points. Mercury (top left), Saturn (lower left), and a bright star to the right of the planes form a triangle. The name of that star is Zubenelgenubi, so I’m just going to refer to it as “the star” if that’s okay with you. Matching those reference points up in Stellarium (planetarium software), we can see where ISON should have been. A view from Stellarium with the atmosphere turned on to simulate what we should have been able to see. So, we see where ISON should be. It’s in clear sky, but did the camera capture it at all or was it completely washed out? One of Lightroom’s tricks is a tool that helps you remove spots cleverly named the Spot Removal Tool. When you’re in spot removal mode, there are a number of options that appear along the bottom. The one labeled Visualize Spots is, and I bet you’re way ahead of me here, designed to help you see the spots in your photo that are hard to see when viewing the photo normally… until you’ve printed or uploaded or sent them off to a client, that is. When you check that box, the view switches to a very high contrast view that makes otherwise hard to see specks stand out quite well. Moving the slider left and right allows you to fine-tune the results. This tool is designed for finding things like sensor dust spots against a blue sky, but as it turns out, it works really well for seeing stars. So if we click on the spot removal tool (red circle in the top right) and then check the Visualize Spots box (red circle in the lower left), we can now see what’s hiding in our sky. The view from Stellarium with the atmosphere turned off and the yellow arrows again to make the specks easier to see. It looks like we caught comet ISON! It’s almost imperceptible, sure, but it’s there! The Visualize Spots tool is quite handy for bringing out stars and helping you identify what’s in your photo. If you know of other uses for this or have something to add, I’d love to hear your ideas. And as far as the photo goes, I set out to capture a landscape that included comet ISON against a well-known landmark. While it’s not a giant-tailed comet shining bright in the sky (like we hope it becomes in the next week as it passes around the sun), there are definitely photons from ISON in what my camera captured. So, while I wouldn’t tout this image as a clear shot of ISON, I’m definitely chalking it up as a technical victory. By request, here are the slides from last night’s presentation on ISON to Exposure Roanoke. The resources and tools we talked about are listed on the last slide. Last week I spent some time in my friends’ studio working on replicating a natural light scene with flash. Today, I was fortunate to have the photographers from Bold Sheep Photography do two shoots for me – one with natural light and then an identical one with flash. Two are flash, two are natural light. Click image to enlarge. Again, two flash and two natural light. Click to image to enlarge. Flash units not firing at the same time. The worst thing about shooting flash is that you’re shooting flash. What I mean by that is that it’s only going to perform as well as your equipment and experience using that equipment. Sometimes things work like a dream and you don’t give it a second thought. Other times, you wonder if the frustration is worth it. Today started as a good example of that. When I did the first test I was using a Nikon system – two SB900s, an SB800, and a SB600. I have plenty of experience with Nikon flashes and things just seemed to play well together for me that day. Problem is Jaime and Dave are Canon shooters which meant if we used my flashes we’d be climbing in and out of the flash box to adjust power settings manually instead of setting them from the camera. To work around that problem we borrowed a pile of Canon flashes and pocket wizards that would allow them to do the same thing that I was doing with Nikon’s CLS. I was setting the panel up so I’m not sure on the specific technical issues that were causing trouble, but some combination of hardware not working together, unfamiliar equipment, and dead batteries came together to create 15 minutes of head scratching and troubleshooting on why all four flashes wouldn’t fire at the same time. However, once it started working, it stayed working. Thanks to Curt for doing whatever he did to solve the issues so we could carry on with the shoot. One limitation to shooting flash is the recycle time (the time it takes for the flash to charge back up and get ready to fire again.) That’s obvious and we knew it going in. What I wasn’t expecting was the effect that had on the model. In what I would best describe as a pose-click-pose-click-pose-click approach, they were able to knock out a series of great shots very quickly while working in constant light. With the flash recycle time introduced the model ended up having to hold her poses for longer periods – pose-click-pose-wait-click-pose-wait-click. I would imagine this is something that you could adjust to or solve with better gear, but I found it to be a quite interesting nonetheless. 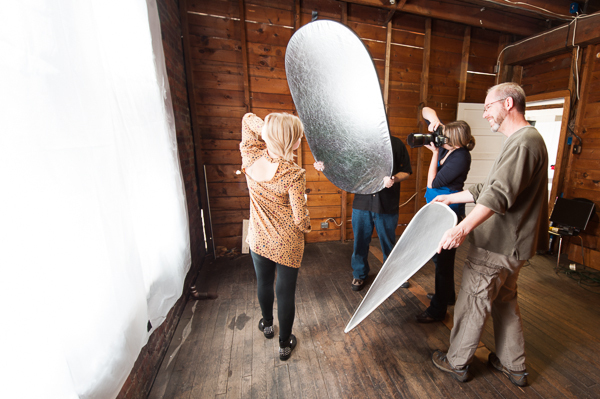 Using the flash panel as a white seamless backdrop. Heather, our gracious model, added an interesting point in our post shoot discussion. She said the flash setup made her feel more creative. Whether it was the novelty or the increased number of options that did it, I’m not sure, but it seemed like the case when they took a departure from the scheduled shoot to try using the panel as a backlight. Thanks again to Jaime and Dave who did a great job shooting (as usual) and who were kind enough to provide me with the RAW files so I could pixel peep to scour for differences and also put together the above compilations. I’ve had a large number of guesses at which are flash and which are natural. For the most part they’ve been incorrect or partially correct. A couple of astute observers spotted things in the scene that confirmed their suspicions. Each photo has multiple tells when you know what to look for, but they’re less about how the light looks and more about the effect… pupil size, for instance. I’m very happy overall with how this experiment turned out. As I said in the first post where I went over how I built the lightbox, the point of this wasn’t to support one side of the flash vs. natural argument. It’s to push the idea that light is just light and the more you understand how it works and how to control it, the less the source matters. Flash: Bottom left, bottom right. Natural: Top left, top right.